It is a fact that we allow external circumstances to rule over our attitudes and behavior. You might get angry, bemoaned your fate when things aren’t good or even have a negative perspective about life. 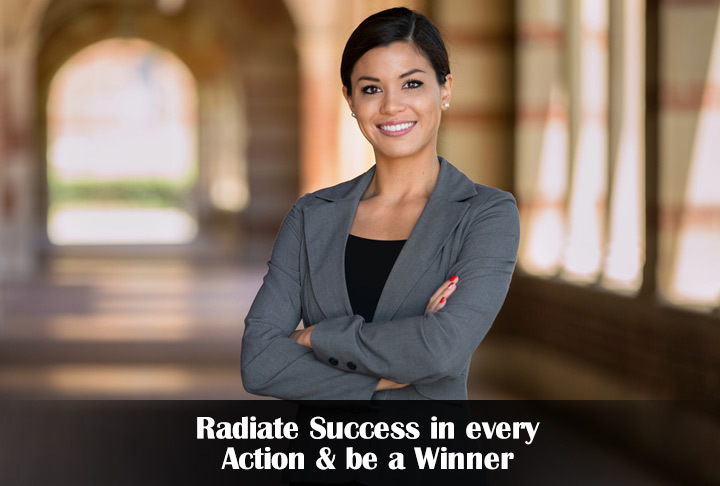 However, successful people radiate success in every action and be a winner. If you are looking to stay upbeat and positive about your life and be successful at finding your love or getting a promotion, you need to have that positive and successful aura around you. Successful people never think about being defeated but continue to be upbeat and think about winning even under the most difficult circumstances. And you need to shed your worries and start thinking positive. They use the Law of Attraction by thinking about their achievements and success constantly. You really have no idea how much you can accomplish when you start turning towards a more positive approach in life. To radiate success in every action and be a winner, you need to start behaving and thinking like winner. If you think you can do it, you will be able to do it with confidence. And that is because only you can place the limitations on your mind through the ways you think. When you think negative, you attract negativity but when you think positive thoughts, you attract everything that can help you win and succeed in your endeavors. So don’t limit your thinking and potential to win. You know yourself best. Work on your flaws and make them your strength. If you get angry quickly, turn it into determination and patience. Get angry with yourself when you work slowly or start thinking negative. Similarly, enhance your strengths, focus on what you can do and negate your flaws with time.